How does Boutique South America Work? We’re different to other travel companies because we provide options for you based on how you like to research, plan, book and experience your travel. We believe it’s important to offer solutions that cater to current travellers, that’s why we’re internet based and embrace the digital platform so we can easily provide you more of the updated information you require to make confident travel choices. And by combining this with our knowledge and expertise of amazing places to see, great places to stay and fantastic things to do throughout South America, we aim to offer you the best possible experience of it. So the big question is, what sort of a traveller are you? Build it Yourself travellers are savvy, love to research and spend time putting together holidays almost as much as being on holidays. They’re looking for ultimate experiences in amazing places but are happy to fill in the gaps in between locations (in terms of flights and city hotels) themselves. Our Build it Yourself range of packages is a curated collection of programs. Many of these packages are offered on an all inclusive basis, so your activities and meals are taken care of in highlight locations. Custom Experience travellers like to have some idea of how to experience different places but have varied interests and want to find out if a place is worthwhile or not based on what there is to do there. They’re looking for a framework or package ideas, they don’t like to rush when on holidays and take their time to explore each location. Their emphasis is on the experience and how they discover each particular place. 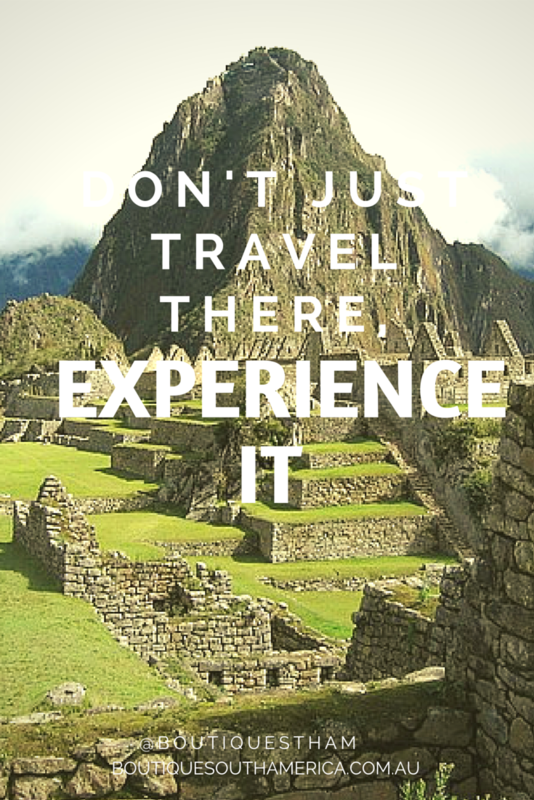 Our Custom Travel Experiences are travel packages with a difference. Designed to appeal to more travellers by offering them the choice of excursions in different places as well as their travel accommodation style. Our approach to excursions is multi-sensory as we believe the cities and attractions in South America are multi dimensional. We give you the most interesting and varied offerings available in each place for you to choose between and make your experience truly individual. Bespoke Travellers have some idea of what they want to see in South America but would like some guidance to make sure they are making the right choices. They also want assistance on putting the many pieces of their holiday puzzle together or even assistance narrowing down their wishlist to make it more workable. Our South America Travel Specialists are on hand to guide Bespoke Travellers through research, planning and booking process as well as making sure your entire journey works like clockwork. From choosing where to travel, to a hotel that suits your needs and reflects your personal style, to tour and activity recommendations and even creating a personalised flight solution so that you can seamlessly move from place to place and country, we can tailor your holiday program, from the ground up. In case you needed more reasons apart from the truly great travel experiences on offer in South America, here are some that set Boutique South America apart from the rest. Want a recommendation you can trust? Each of our hotels and activities have been personally selected by South America specialists because of the convenience of the location and possibility it can add to your your journey. We stand by the experiences we sell because they’ve been tested on hundreds of travellers before you. Travel is not just about seeing, but feeling, touching, tasting and doing. That’s what you’ll remember and that’s how we approach your holiday to South America. We don’t put you on run of the mill tours, but excursions and activities that will immerse you into the local culture and landscapes. We believe the greatest luxury in life is choice and the second is time. That’s why we try and provide both in our travel packages. Our BIY programs that are inclusive of activities and where often you will be able to choose how to explore iconic locations and our Custom Experiences are frameworks that give you the power to decide your excursions in different places. And Bespoke Journeys are a personalised travel service where we create your dream vacation of South America from the ground up. You love travel planning but don’t have hours to spend to make sure every detail is just right. 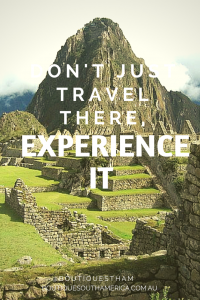 We give you the best South America travel advice on our InspireMe blog for free, provide the best travel experiences through our BIY and Custom Travel packages and have experts to guide you through the decision making process so you can save time and energy. Travel is a rewarding experience and because you’ve chosen Boutique South America, we want to give you even even more reasons to enjoy your trip. Each booking recieves one quality travel wallet (no tacky plastic sleeves here) and every Custom Experience comes with a bonus stylish camera day bag. Each Bespoke Journey booking is also entitled to one larger weekender style satchel bag to help you pack and prepare for your travels.We choose the highest quality products and purposely don’t brand our Voyage Packs so you feel comfortable using your travel gifts again and again. Travel is a gift towards your experience and we believe in sharing the love. Boutique South America partners with projects on GlobalGiving, so that as a business and as a customer, you can contribute towards the places you will visit. Each six months we select one project to support that each Custom Experience and Bespoke Journey booking automatically donates US$20-$25 towards. BIY Travellers will also have the option to support these community initiatives after their purchase. More about Boutique South America’s responsible tourism initiatives here. Who doesn’t hate hidden fees? We like to be upfront about our pricing so we only charge US$10 in bank charges for BIY packages and the pricing for Custom Experiences and Bespoke Journeys are inclusive of any merchant fees. Why do we charge in USD instead of AUD? Because our suppliers take payment in USD, so our prices to you don’t change from week to week and we don’t spend time and money converting currency back and forth. As you normally book well in advance, you don’t need to pay your entire holiday straight away and make a big lump sum payment if you don’t want to. Most programs only require a deposit of 30% to secure them and you can pay the remainder 60 or 90 days before your holiday starts. We even offer payment plans to make paying your trip off that little bit easier. Feel safe as you buy your travel products online by purchasing through Paypal, one of the world’s most secure payment gateways. Don’t have a Paypal account? You can still use this encrypted online system as a guest. You’ve invested in your travel so you shouldn’t have to print out your confirmations yourself. All travel bookings come with a set of Personalised Travel Documents delivered to your address. We also send you an e-copy for you to have on hand and leave with a family member. Yes, if you book your flights with Boutique South America as part of your Custom Experience or Bespoke Journey, we guarantee that you will make it to the airport on time. Your on the ground pick up and drop off service will reconfirm your flights, advise if you have any time changes and make sure you get to the airport on time. Take the hassle out of getting from A to B or wasting your precious holiday time trying to find a place to stay when you arrive. By prebooking, you can relax knowing that someone will be waiting for you on arrival at the airport and that you will make it to the attraction you want to see on time. Perfect if only have a few days in each place. You’re independent back home, so you should be when you travel too. Our programs for independent travellers are beautifully balanced to structure your journey without making you feel like you’re being baby sat. Most tours are scheduled in the morning or day so you have your afternoons or evenings to explore a place for yourself, because one of the joys of travelling is discovering somewhere in your own way. Most travellers agree that a local perspective adds insight to their travels and that’s why we use local guides to take you through South America. Most of our guides are also extremely knowledgeable, some university trained and of course bi-lingual, so they can explain the ins and outs of places you visit. We can secure your space by conducting a free availability check to hold your options in each country you travel so you can make sure all components of your itinerary work and fit properly before you pay deposit. Rest assured you are booking from a quality travel provider as Boutique South America is an Australian incorporated company, a member of ATAS and subject to Australian rules and consumer law.